What does African public transportation look like? Trains, in the few countries that have them, are sparse and disconnected between regions. Buses are long, slow, and limited to urban transport. Cars and moto-taxis zip through cities and paved roads. The most prominent form of transportation, the minibus (aka Matatu, Tro-Tros, Matalu) can be found just about everywhere braving some of the most undeveloped, even flooded, roads, squeezing in as many passengers as it possibly can. But still, the majority of people, particularly in rural areas, are inaccessible by public transport due to the lack of infrastructure. A few may own or borrow a bicycle, but the majority simply walk for hours, sometimes days, to get where they need to go. 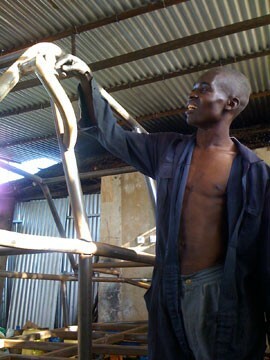 In 2009 I met Joel Jackson, who was working in a welding shop in Kilifi, Kenya about an hour north of Mombasa. He was building a prototype for Mobius Motors, an African car company in its infancy, developing the first car targeting African consumers, a car he describes as more “relevant,” affordable, and functional. A recent New York Times article on the falling sales of the Tata Nano, an affordable car for the Indian masses, supports his theory, which places a priority on utility instead of solely on cost. NextBillion.net: What problem are you addressing with Mobius and what are some of the needs you’ve uncovered? Joel Jackson: Africa’s 550 million (according to C-GIDD & McKinsey) low-income consumers at the base of the pyramid are largely immobile. Without transport fit for their needs, they’re struggling to access hospitals, doctors, schools, jobs and outlets to buy and sell goods – particularly in rural areas. While I was working with an NGO in Kenya, I saw first-hand how families would regularly walk many miles to carry water, farm produce, or a sick child in urgent need of medical care. I also noticed how the need for appropriate transport is compounded by chronic government underinvestment in roads and public transit. I learned that the lowest income consumers cannot afford and do not expect to own a vehicle. Instead, they want affordable, practical and safe transport services to finally become mobile. And by becoming mobile they become connected to a wealth of opportunity. NextBillion.net: What’s the best way to address the issues of mobility in these areas? Joel Jackson: We believe appropriate transport unlocks socio-economic development. With this aim, we disseminate affordable and functional vehicles fit for Africa’s degraded roads to emerging middle-income buyers ($10k-$20k annual household income). To maximize our impact we mainly target entrepreneurial buyers wanting to use their vehicles as a platform for a transportation business. We provide these entrepreneurs with business advice and financing options to innovate and operate relevant transport services to lower income end-users in their communities. The range of business-in-a-box opportunities is vast, from existing privatized public transport to consumer goods distribution (e.g. 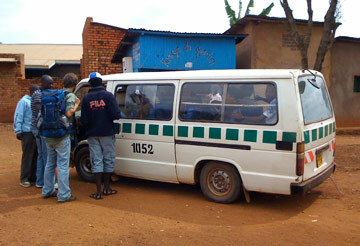 clean water, cooking fuel, farm produce, etc) to remote medical care to local school buses. These are mobility centric services that will drive systemic change in the transport industry, the platform on which all other products and services are delivered from A to B. But to serve African market demand, we must re-imagine the car. Mobius simplifies its vehicles by removing expensive technologies such as air conditioning, interior fixtures and even glass windows while still maximizing function with good suspension, handling and storage. We also simplify our production process by integrating off-the-shelf parts within a durable and safe tubular steel frame. The result: low-cost high-functioning modular vehicles built specifically for the needs of developing world consumers. In short, a platform for mobility. NextBillion.net: What has been the biggest surprise and opportunity in exploring this industry? Joel Jackson: The most remarkable thing about the African auto industry is the fundamental disconnect between international production and domestic markets. Unlike the more aligned markets of the west where vehicles neatly serve buyer demand, the majority of cars in Africa are imported from more affluent countries like Japan, Germany and even India. Manufacturers in these countries mainly compete to serve a developed-world demand for features, styling, comfort, performance and space, creating vehicles that just aren’t pertinent for the developing world. What’s surprising is that despite a total lack of appropriate transport options, high general demand for mobility fuels a $60 billion annual transport market in Africa. Right now, the market comprises two sets of vehicles, low-cost low-functionality cars (e.g. small/micro cars that struggle to traverse rural terrain, carry heavy loads etc.) or high-cost high-functionality cars (e.g. off-road 4x4s that are prohibitively expensive to most buyers). What’s needed is low-cost high-functionality vehicles. Yet each year millions of vehicles are imported and driven on the continent’s heavily degraded roads that are either inadequate for their environment or prohibitively expensive for most buyers. So the developing world remains largely underserved by a disconnected and weak regional automotive industry even though the market opportunity is immediate and vast. NextBillion.net. What are the traits of a car designed in and for Africa? Joel Jackson: To understand what buyers and end-users look for in a vehicle we surveyed 500 consumers in Kenya. The most important purchase criterion for our target demographic is price. 64% of potential buyers told us they can pay $6,000 (equivalent to the price of an auto rickshaw) or more to purchase a vehicle. Beyond vehicle cost, these consumers also care about the cost to maintain and run a vehicle so reliability and fuel efficiency are essential as well. The second most important purchase criterion is functionality. Functionality includes vehicle power, handling, and passenger/storage capacity. Maximizing vehicle functionality in Africa means great terrain coverage to traverse bumpy dirt roads, ample loading capacity to carry large/heavy cargo and basic performance to travel long distances quickly. Lastly, although buyers are constrained by price, most consumers aspire to own a cool and unique car. They care less about standards of comfort, features, luxury; and more about customization, relevance and innovation in a vehicle. We design specifically for these traits to serve the demands of Africa’s consumers. 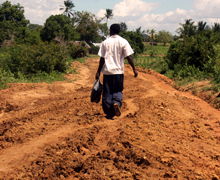 (Above: The majority of African roads are underdeveloped and difficult for inexpensive cars to traverse. Image courtesy of Mobius). NextBillion.net: Why do you do what you do? Joel Jackson: I founded Mobius to change the world. Not by making wealthy economies wealthier but by mobilizing emerging markets, starting in Africa. Effective transport underpins development but sadly is often overlooked. It provides access to education, healthcare, markets and employment. It connects families with loved ones and supports the exchange of products, services and ideas. Imagine your life without transport for just one week. How would your children get to school, how would you get to work, what would you eat and what would you do in a medical emergency? Although developing-world transport presents a huge market opportunity it also suffers from acute market failure with misaligned products and services. Mobius aims to readdress the transport imbalance and mobilize the developing world. This is a vision worth dedicating my career towards, which is why I do what I do.